CHICAGO—The Walton Family Foundation, led by heirs to the Walmart fortune, says it wants to improve education. But the public is increasingly asking whether the WFF’s corporate-style, privatization-oriented approach to reform, based on the mistaken premise that competitive market dynamics apply to K-12 education just like they apply to Walmart stores, is right for our schools. 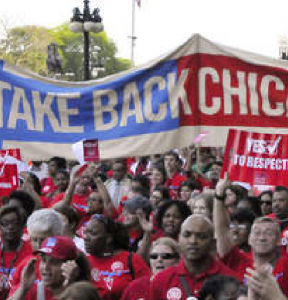 The family’s recent involvement in the Chicago Public Schools (CPS) school closing controversy is a prime example of the ways in which Walton family’s education agenda can actually harm schools, communities, and students, according to the Chicago Teachers Union (CTU). Citing budget deficits and lower enrollments, CPS officials—led by the Broad Foundation’s Barbara Byrd-Bennett, who previously led mass school closures and teacher firings in Cleveland and Detroit—announced last month as Chicago’s new schools chief that the district would close 54 “underutilized” schools, mainly in majority black, low-income neighborhoods. (The mayor-appointed Board of Education is set to vote on approving the closures May 22.) 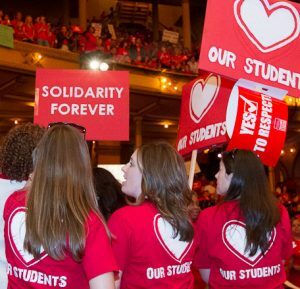 Defenders of public schools say that CPS has sought to weaken and close public schools in order to open more charter schools, which are often under-regulated, lack adequate oversight, and cherry-pick top students while leaving behind others. In 2011, CPS’s Chief Operating Officer even admitted that the system was intentionally underinvesting in low-performing schools that it might close someday. As CPS prepared its closure list, the Walton Family Foundation bankrolled a “community engagement process,” with meetings led by Walton-paid consultants, to provide the illusion that the school closure process was open and democratic. Meanwhile, the Waltons also paid $3.8 million in 2012 to open new charter schools in Chicago. Given the Waltons’ strong support of school vouchers and charter schools, public school supporters were deeply skeptical that public opinion was truly meant to be heard and fully considered at these meetings. Media were banned from attending, but Walton Family Foundation staff attended. Now the family is funding a series of ads and videos that the system is using to try to justify the closings. According to a University of Chicago study of recent Chicago school closures, only six percent of students whose neighborhood school closed moved to an academically sound school. In addition, the study found that school closures are a “substantial burden” on students, families, communities, and school staff: Students face difficult adjustments to new schools, neighborhoods lose a community anchor, and school staff becomes unemployed. Parents in Chicago are also acutely concerned about the safety of their children if they are sent to schools outside the neighborhood, possibly into gang territory. The way the Walton family has interfered in Chicago, working to shutter public schools while simultaneously opening unproven, under-regulated alternatives, makes it clear that their primary interest is not better education for kids, but rather undermining public schools in order to promote an alternative, private-style school system, Lewis said. It’s even worse that they are interfering in a community they are not part of, where they can use their wealth to push their beliefs on other people’s children, avoid any of the impact or risks, and escape accountability. Corporate reformers insist that students and teachers have to be accountable, but apparently will give a pass to the nation’s wealthiest family. Ironically, one of the things shown repeatedly to improve academic performance is improving the economic situation for children and their families. While the Walton family likes to talk about how they value all children, Walmart, which the family controls roughly half of, continues to keep many of its associates in poverty, with low wages, poor benefits and the kinds of unpredictable schedules that make parenting even more difficult. If the Waltons were truly concerned about lifting all boats, they could start with something directly under their control—living wages for 1.3 million Walmart workers in the United States alone. In the ideal Walton world, schools would compete against each other for students, resources, and test scores. But there’s a problem: When there is a competition with winners and losers, there are inevitably losers. Chicago parents don’t want their children to be on the losing team in the Walton-engineered competition.